This plug-and-plug omnidirectional condenser microphone is portable and easy to use. It comes with a 3.5 mm stereo plug that is appropriate for the majority of laptops and PCs. 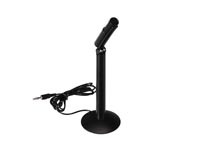 With -30 dB +/- 3 dB sensitivity and a frequency range of 50 Hz-16 kHz, this does just what a simple microphone should do - hook up to our computers easily and record\portray some sound to others.